High School was hell for some people. There was a lot of drama, with people trying to date each other or mess with each other, but at the end there was the promised land of prom. 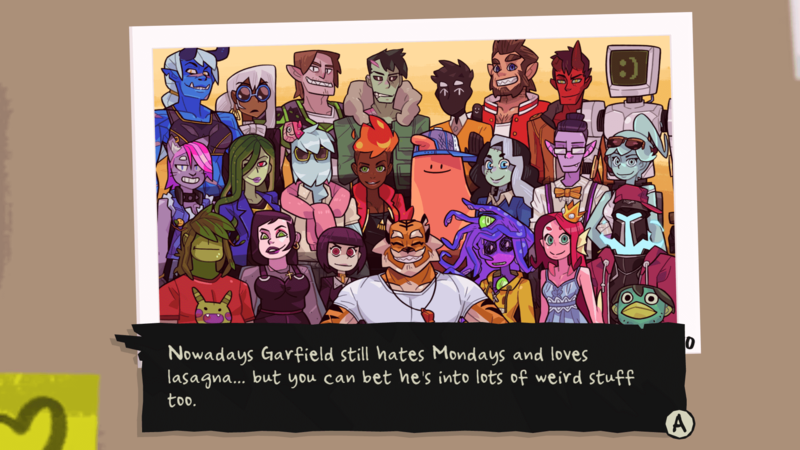 Monster Prom works on that premise as a multiplayer dating sim, except everyone is a monster. Both literally and figuratively. 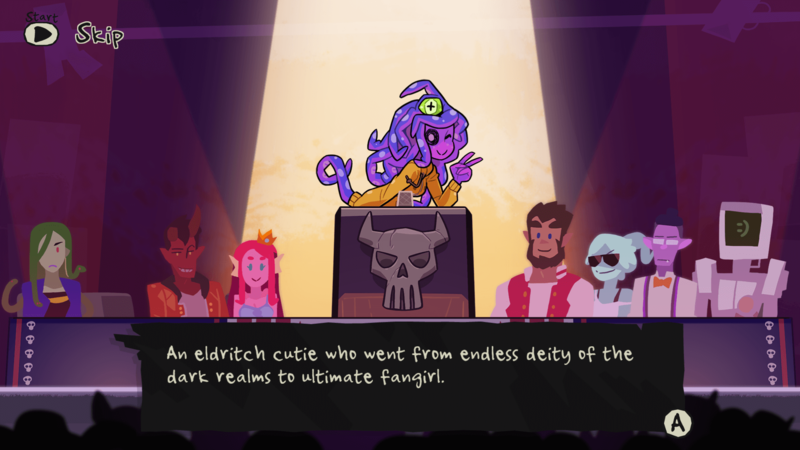 As mentioned previously, Monster Prom is a dating sim in the style of, and inspired by, Yawhg. Every turn every player chooses their action in Spooky High, which results in a bonus to one of their statistics as well as an event with a choice that can either give you even more stats or get you points with a classmate. This is vital, as by the end of the game you are inviting one of them to the titular Monster Prom. They’re all amazing and I want to date all of them at the same time. In between traditional rounds of players’ actions, which play out in order (based on a quick debating minigame after each round), there are also events in the cafeteria (which can only reward you with love points) and weekend events. Those usually require you to either answer about other player (giving you a chance to screw them up) or choose another player to team up with to achieve a certain goal threshold. The game allows for both online and local multiplayer for up to 4 players as well as through sharing a controller between players, something quite useful if you want to play at a party. This adds a new level of play as someone may want to ask the same monster as you out. You can also decide whether you want a short or a long game, which could mean playing for up to 2 hours if you feel like it. Visual novels are often known to have very little on the visual side of things. Beautiful Glitch decided to dunk on that idea, with a multitude of main and secondary characters, each with a bunch of different faces and actions (and outfits, thanks to summer/winter updates). There’s also a couple of unique backgrounds, and a lot of extra art such as polaroids that you can collect when doing different endings. Garfield is truly a monster amongst us. On the audio side of things, no complaints. Every single character has voice clips that play when needed, there are tracks playing in the background that do get a bit repetitive after a while but they feel right for this type of game. The additional songs, whether from bands or made for the game, feel right where they should be. Monster Prom is crass and definitely not for kids. It’s filled with characters being terrible, adult humor, poisonings and trying to get it on with a plate of pasta. And it does it all well. The jokes are well constructed and never in poor taste and the violence and terribleness makes sense since everyone is a literal teenage monster. It is fully aware of its genre and makes fun of all the traditional tropes and game mechanics such as stats or numerical way to count love. It also makes fun of things worth making fun of, such as gatekeeping or bourgeoisie. And it does all that while still being incredibly inclusive and allowing each player to choose their pronouns for the game. I think this screen really summarizes the game. It is also chock full of content. It boasts over a thousand different events, each with two (or more if you fail the required stat threshold) outcomes. You can date and fail to date each character and with more endings you unlock stuff in the store which allows to get secret endings. Two of characters from secret endings of the base game end up being dateable classmates in the DLC. And the DLC, aptly named Second Term adds not only those two new cuties, but even more events, side characters and secret endings including them. I recently got to go the Prom with a blue demon by buying a map and going along with what the game threw my way. Even more in-game art, concept art, polaroids and exclusive fan art can be unlocked as well, all of excellent quality. And while it feels good playing by yourself, I found the most fun playing with friends, trying to either compete for someone’s heart, unlocking more endings or just voice acting our way through the game. Arguing about weird stuff to debate the next turn’s order makes it so much better. The experience is definitely heightened by sharing it with others, and trying to figure out how to be your worst self. While it certainly isn’t for everybody. 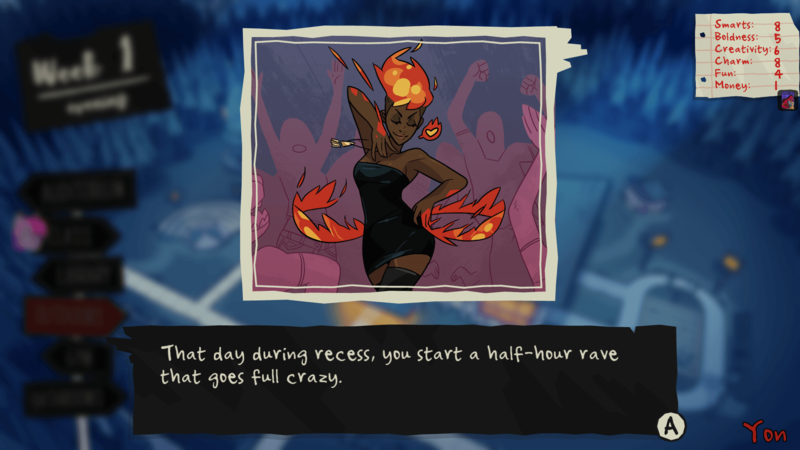 If you enjoy trying to bed a party ghost while your friend is failing to seduce an elder god then Monster Prom will keep your interest for a long while. It’s the perfect game to put on with all your terrible friends to enjoy with. Now, if you excuse me I have a very good boy werewolf to seduce. Monster Prom is available on PC, Mac and Linux, the DLC Second Term has just come out. A non-binary ludomancy witch and a student on a games course. Loves playing and creating indie games. Also enjoys wrestling, RPGs and having money. They/Them.